Many times Windows users are annoyed with popup balloon notification telling you things that you already know .So here is a simple way to disable Balloon notifications using your Registry. If you have any problem in opening registry editor Click here to fix it. 4. 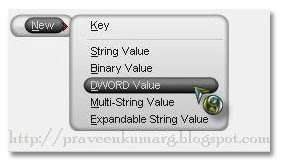 On the right pane right click on an open area and choose New–> DWORD Value. 5. You will see New Value #1.Now rename New Value #1 to EnableBalloonTips. 6. Next double click the new registry entry you created. In the Value Data field set it to 0(zero). 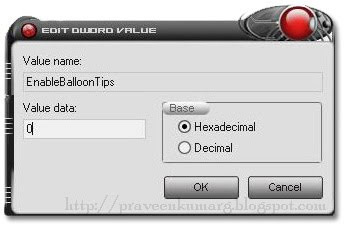 Also make sure Hexadecimal is selected under Base. Just restart your system and now you can get rid of those Balloon Notification popups . is there an easier way for beginners? Like a download automatic solution for windows xp?